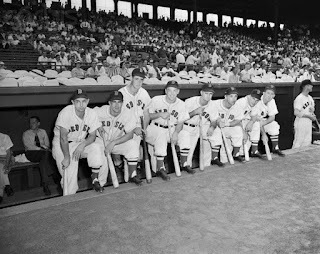 April is over in our 1948 Red Sox Season Replay and the Red Sox stand at 6-5 and two games out of first place. It has been a strange 11 games as the Red Sox offense is struggling while the pitching has been great. The Red Sox have just four homers as a team which ranks 6th in the 8 team American League. Ted Williams and Vern Stephens have yet to homer. Billy Goodman is hitting a robust .476 while Bobby Doerr has three of the four Red Sox homers. Goodman has a 0.9 WAR which is tied for league best with Joe DiMaggio of the Yankees and Jerry Priddy of the Browns. Goodman also has current ten game hitting streak. DiMaggio and Priddy are also tied for the league lead in homers at 5. Pat Mullin of the first place Tigers has driven in 15 runs which leads the AL. Below are the Red Sox team stats, standings and league leaders for both the American League and National League Click on pictures to enlarge them.